Are you all getting ready for Thanksgiving and all the fall festivities? Fall is my favorite season and I love doing tablescapes this time of year! For that reason, I’ve created a free e-book with twelve of my favorite tables for lots more inspiration for you! Today, I’m sharing a fall tablescape that I did a couple of weeks ago for a dinner party. At the time, it was before Halloween, and pretty far from Thanksgiving, so I didn’t want to go with a lot of traditional fall colors. I wanted to do mostly creams and neutrals, while still having it feel like fall. 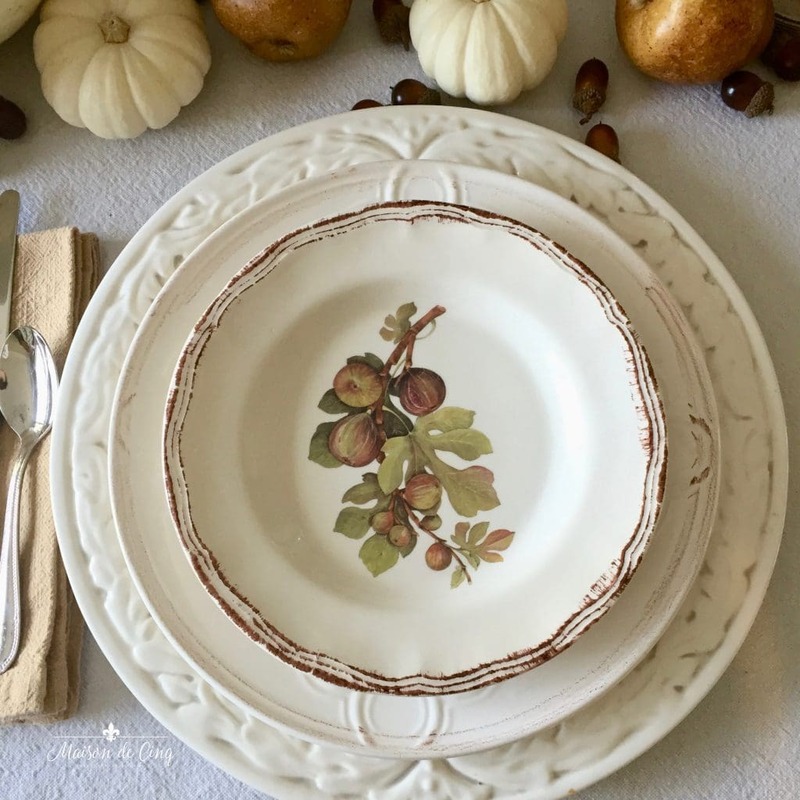 The theme of this fall tablescape started with this fig plate from Home Goods. I love the soft greens and browns, and I layered it with a cream plate and a cream charger. The fig plate is hard to find, however, I found this plate which is similar! White pumpkins made up the central centerpiece with faux pears and acorns scattered around. I love to use natural items like fruits or vegetables when I can. 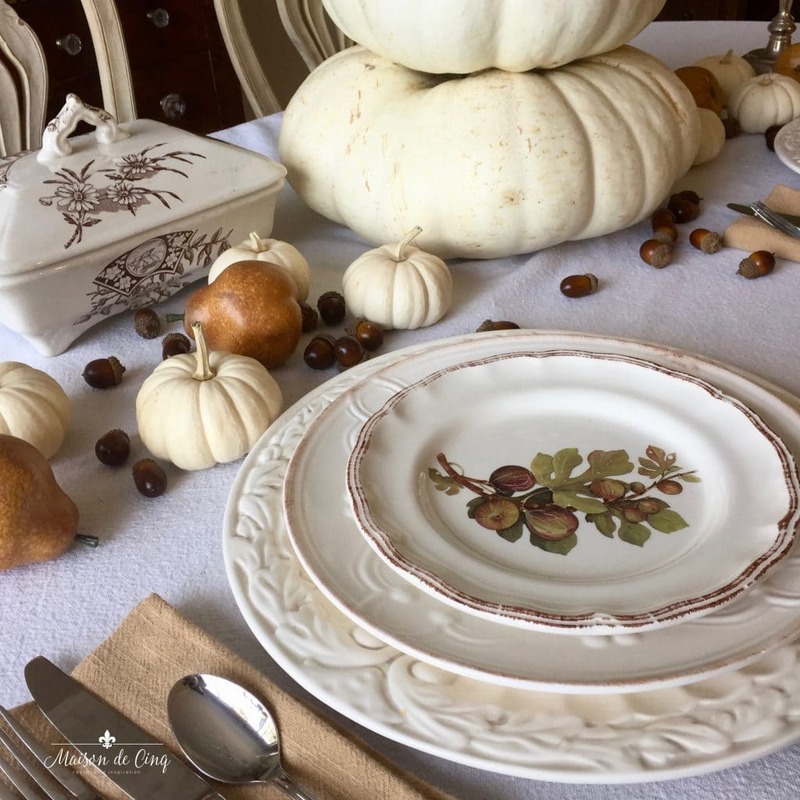 Also, mixing the real pumpkins in with the faux pears and faux acorns makes everything look a little more “real.” I also added some serving pieces in vintage brown transferware that I already had. 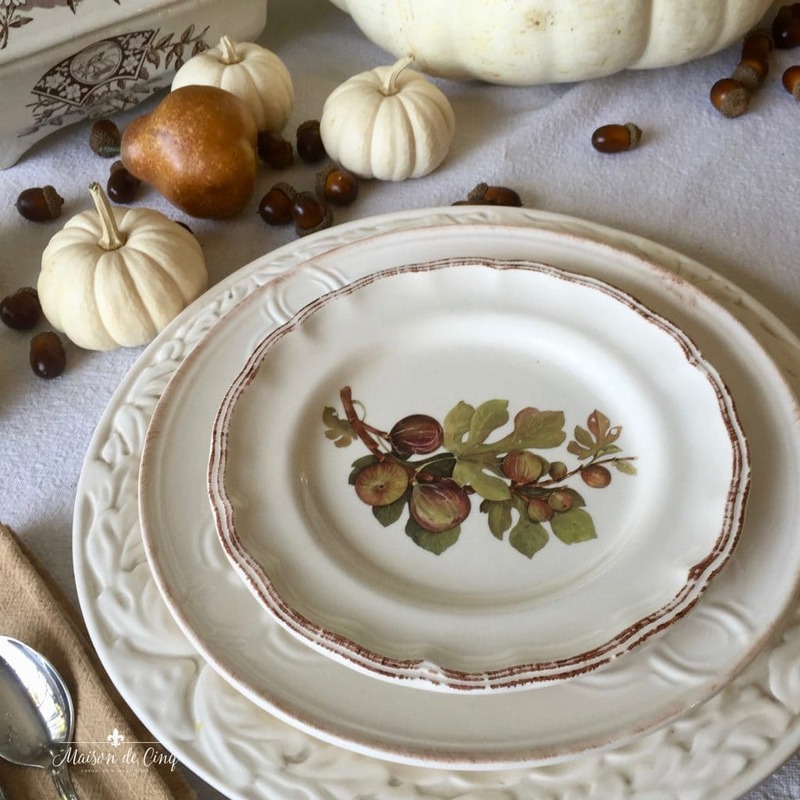 I used a beige linen napkin because I was aiming for that neutral thing, but if I wanted to change this up for Thanksgiving, I would just use a plaid or floral napkin, to amp up the “Thanksgiving” flavor. Don’t forget to sign up for my emails and get my free e-book, A Calendar of Tablescapes! Thanks so much Dianne! And thanks for taking the time to comment – I so appreciate it! Awww, thanks so much Valerie! I so appreciate that! Thanks so much Shannon! And thanks for stopping by and taking the time to comment! Thanks so much Rosie! I really appreciate that. That is what I was going for; the essence of Fall without using the bright colors we normally associate with it. So beautiful. I love the fig plates, in fact, I WANT the fig plates! One more stunning and beautiful tablescape! Such a beautiful Fall tablescape! I love those fig plates! How perfect for Fall! I hope that you are having a wonderful week!!! An absolutely lovely table! 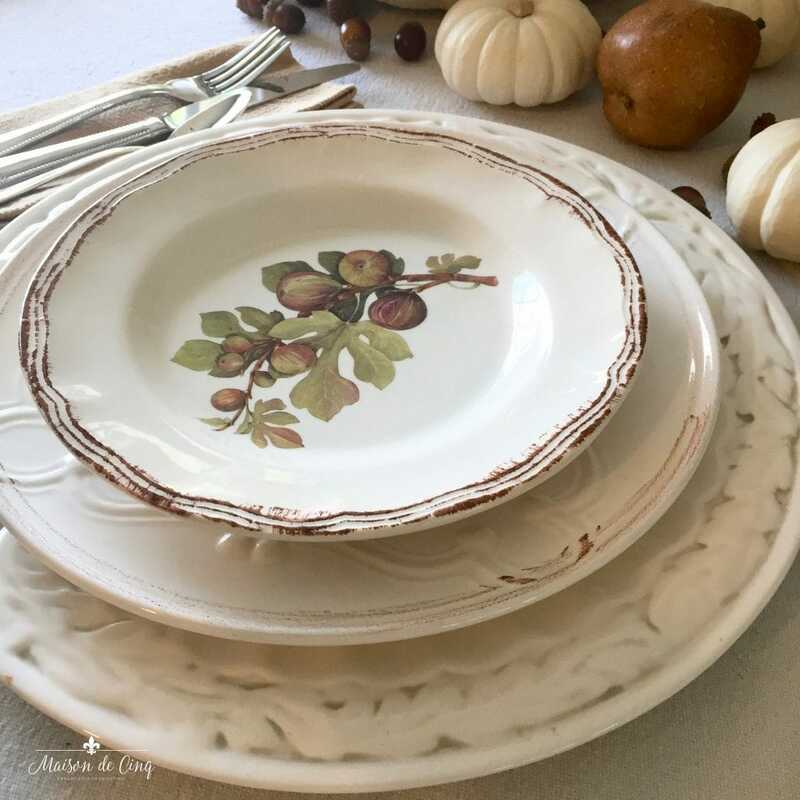 I love your fig plates and it's amazing how you can capture the fall feel without the bright orange and yellow colors! A whole new approach which I really appreciate and will try during this transitional time period! Thank you for sharing. I love your table setting and I am a huge white pumpkin fan as well. It's all so perfect for Thanksgiving. Your dishes are gorgeous! What a pretty table! I like a neutral look any of time of year but especially in the fall. It just feels like it captures the feel of the bare trees and quiet feel. I like your plate stack with all that beautiful texture. Such a gorgeous table! I love your dishes and their great edges all stacked so perfectly together.